Today we have Some thing extra-ordinary for our readers/users which will blow your mind at Once.We have got a tool,Which could get You the Full Bandwidth/Speed of any Publicly Shared Internet/WiFi Connection within a network.Confuse,Lets take a small example,You live in a hostel which have 24mbps broadband network connection which is divided in 24 Users,So each student will get 1 mbps speed on average at peak hours but you want all 24mbps on your computer.Yes it’s possible with the software called Netcut and this is a very small example,You could get even full speed of any cyber cafe/college/airport WiFi network with this amazing software. We are highly thankful to our online reader Nitin Jaiman For sharing this awesome/amazing software with US and According to him,He is using same Software from last 2 years in his Publicly shared broadband internet connection to get maximum speed. 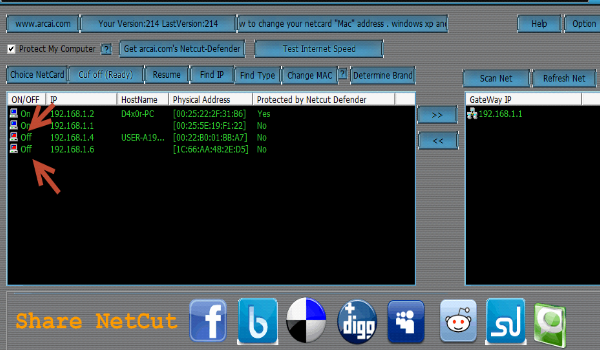 Read More:Pd proxy: A tool to find Open UDP/TCP port to access Free internet On A network. 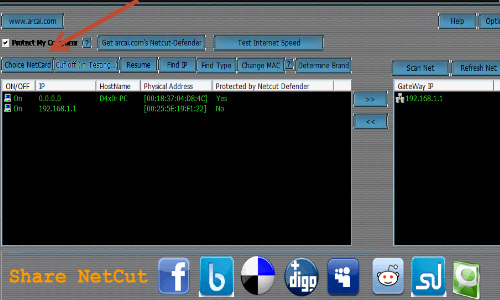 Basically Netcut, is a network tool which can execute several tasks as list IP-MAC table in seconds, turn off & on network on any computer on your LAN including any device like router or switcher. Also, It can protect users from ARP SPOOF attacks. In other words it can cut internet connection of your hostel buddies/neighbours with whom you are sharing your internet.Ultimatly You will getting all bandwidth of Your publicly connected Internet/WiFi connection. Now Install this software and Run it as administrator from Your desktop. 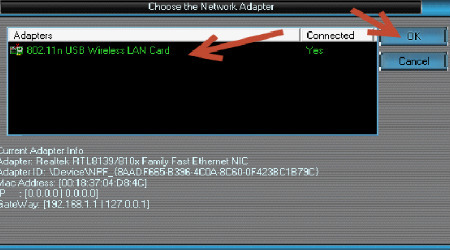 By doing This You get the IP list of Computer’s/device’s connected to that shared network. Now You Just have to “Turn OFF” those IP’s which are Unprotected. So all done,What Are Waiting For,Just check your downloading speed and Enjoy it. Must Read: Trick to Get Password of Secured WiFi Connection Using Android Phones. It’s Just An example,In actually You May see lot of IP’s connected to public internet connection.So You have of Turn OFF of them according to Your need. No one in the network cut off You with ARP spoof technology anymore.So enjoy it Freely. For Wireless connection in Android we suggest you to Use alternative application called wifikill for this task but this application would work on rooted phones only. you can use it on hostels,library,public wifi of airports/malls/mac-d/kfc etc. This version of Software supports upto Windows 7,We have not tested it Windows 8. We hope that You have enjoyed this amazing tutorial to get full speed of any publicly shared internet connection shared by Nitin Jaiman with Us.Stay tunned with us for more&more surpirses like this and don’t forget to like US on our official Facebook Page to get updated with us. Pehli Baar Teri Website se Donwload click karne Se Khushi >..Ho rahi Hey…. is there any option to just decrease the speed not just cut off . in other places some tech people do find out this software the one who is using it1 any idea how to stay hidden? sorry bro their no way out for this !!! I am not able to run it on Windows 8..Error is “This app cant run on ur PC..To find a version for ur PC contact software publisher”..
Is there a similar program for use in Apple devices? Does this tool really work??? I mean what is the working logic behind this?? what kind of technology is used..?? Hi, I was wondering if anyone knew of a similar software for Mac OS X. I am looking for something with which to limit bandwidth usage by certain devices on my network! Thank you for the help, it’s much appreciated.